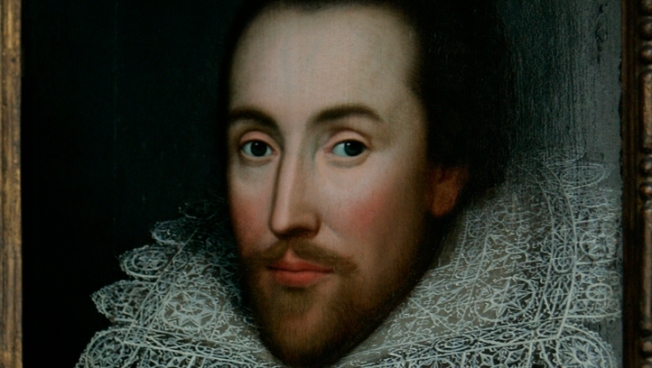 This is a Monday March 9, 2009 file of a then newly-discovered portrait of William Shakespeare, presented by the Shakespeare Birthplace trust. The Chicago Shakespeare Theater's tour of the city's parks launches Sunday. The theater's official opening will be at Eckhart Park on Sunday afternoon. Chicago Shakespeare in the Parks will perform "The Comedy of Errors" free in 18 neighborhood parks through Aug. 25. Organizers expect 20,000 people to attend the performances. Last year was the first season for the program. It's a partnership among the Chicago Shakespeare Theater, the city of Chicago and the Chicago Park District. The theater operates from a special truck that unfolds so actors can perform a 75-minute long, family-friendly production.